Nobody ever says that doing home projects are fun...well, almost nobody. But, this one made me happy. Yep, it's true! Erin and I have been planning to replace the fans in our bathrooms, paint, and hang our barn door for several months now, and this weekend was it. So, as soon as I got off work on Friday, Erin came and picked me and we headed to the hardware store. 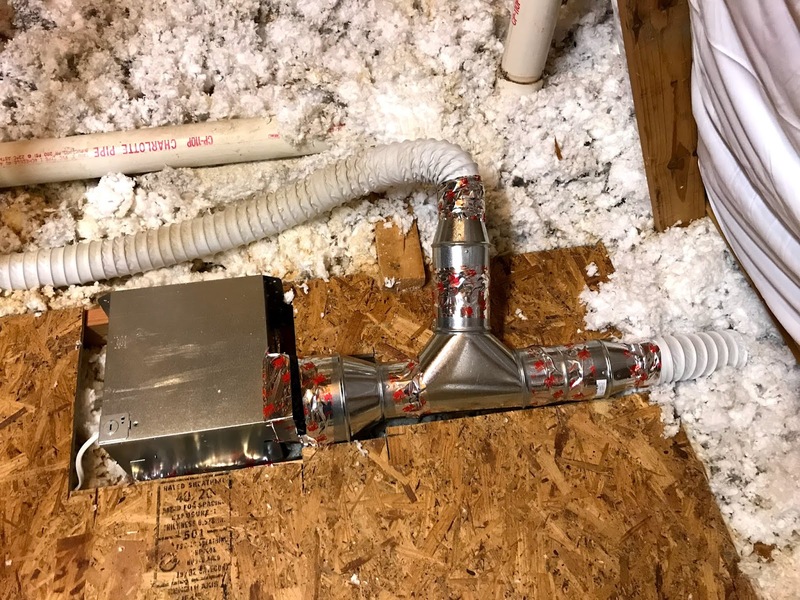 One of the things we had to do was figure out how to connect a super-sucker, modern-day bathroom fan to our antiquated 1980's attic venting. Erin and I worked through the limited available pipe pieces until we came up with a Y-adapter that would connect two fans with 6 inch exhaust pipes to a 3 inch flexi-vent pipe. Be jealous, my Portland peeps! In the end the venting worked perfectly, though this one looks kinda like a scorpion. And this one, well, I don't know, is just a mess. Functional, but a mess nonetheless. And the results... Drumroll please! Okay, so how does all of this tie back in to a dose of happiness? And, really, for me to be happy that's all it takes. She and I had fun picking out our color, piecing together the crazy vent pipe, planning, and ordering the parts. During the project, which took most of the weekend and FOUR total coats of primer and paint (yes, FOUR! ), we talked, laughed, and jammed out to country tunes. Saturday evening, we had to go up to the hardware store for the inevitable thing that we forgot, but instead of driving we took advantage of the beautiful weather and walked. It just kept getting prettier as we walked home. As seeing as how Saturday is also Fryday, we then went to Wendy's, got our small fry, and ate in the parking lot. Dude, tastes SO good after a day of sweating and painting and bending and stooping and wiring in the attic! AND after we finished for the evening, it was pizza night! In my past life I would have done the whole project alone. But my best friend and partner was there every step of the way, and together we rocked it! Deek and Erin, back again, party on party on! This is Deek, giving you a little dose of home project happiness! I love doing anything with you (yes, even bathroom renovations)! You make everything fun, my love! I adore you!! !